With advent of digital television and high definition broadcast, television set top boxes have become quite common in houses today. More and more people are going for DTH services and even the cable operators have started providing digital transmission through set top box. In fact in the metros the set top boxes have become mandatory. But rarely do people understand the power consumption of set top box before using it. And because it takes time to start up (just like a computer), many people keep it on throughout the day. Without realizing, people increase their electricity bill significantly by wasting electricity on standby power for the set top box. There is not enough research done on this in India. But study done by NRDC (Natural Resources Defence Council) suggests that high end set top boxes with HD and DVRs can consume a lot of electricity if they are not switched off from the plug point. Even in the standby mode, these devices consume electricity even when the consumer is neither watching a show nor recording it. With increasing prosperity and disposable income, many families are going for multiple television sets in houses. In case there are multiple television sets at home, most DTH operators install multiple set top boxes, there by adding to the load. With each additional set top box, the units consumed on electricity bill increase significantly. Although we do not have any official source, but from other sources we have found that set top box in India typically consume between 8 Watts to 25 Watts. A standard set top box without a DVR (recording facility) consumes about 8 watts of power which if left on for 24 hours can consume about 70 units in a year. Set top box with standard definition and DVR as well as set top box with high definition and no DVR consume about 18 watts of power which if left on for 24 hours can consume about 158 units in year. A HD set top box with DVR consumes about 25 watts of power which is about 219 units if left on for 24 hours all through the year. 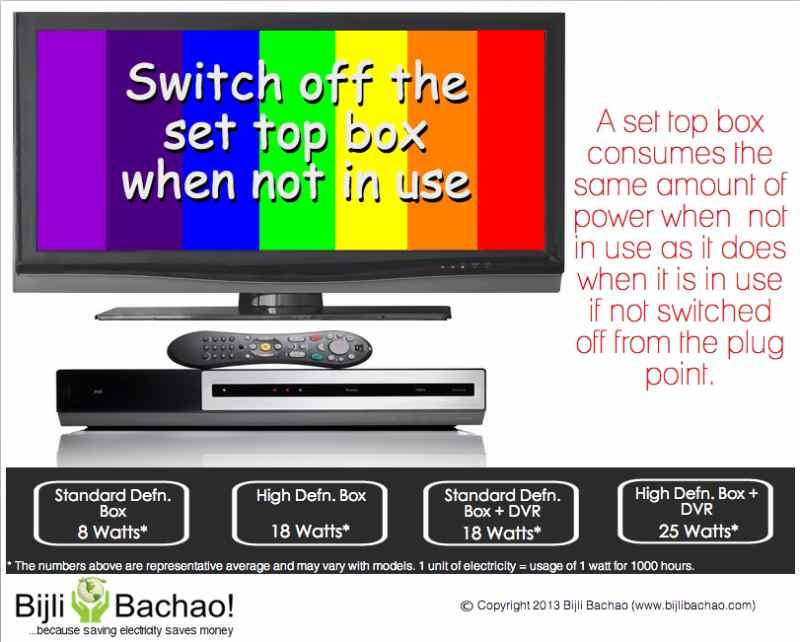 It is observed that the power consumption of set top boxes is almost the same when in use and when not in use (if left switched on) thus resulting in leakage of electricity. Although it may seem inconvenient as it takes time to start up, but if electricity saving is your priority, then it is better that it is turned off from the power point when not in use.